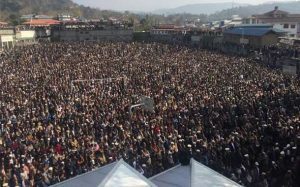 Rawalakot: The President of Jammu and Kashmir Peoples Party (JKPP) and member of Azad Jammu and Legislative Assembly, Sardar Khalid Ibrahim Khan who was passed away Sunday morning after a brief illness, has been laid to rest amid sobs and tears and in presence of thousands of mourners at Kot Matay Khan village in Rawalakot District on Monday. He was buried next to his father Sardar Muhammad Ibrahim Khan, who was the founding President of Azad Jammu and Kashmir and served as the President of the state for four times. 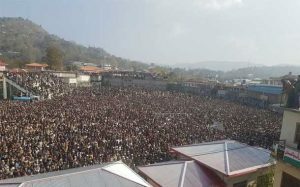 Prominent religious scholar, Moulana Muhammad Saeed Yousaf led the funeral prayer that was attended by Azad Jammu and President, Sardar Masood Khan, Acting AJK Prime Minister, Chaudhry Tariq Farooq, Former AJK Prime Minister Chaudhry Abdul Majid, Speaker AJK Legislative Assembly, Shah Ghulam Qadir AJK Minister Sardar Farooq Ahmed Tahir, Minister Information, Raja Mushtaq Minhas, Minister Civil Defence, Chaudhry Masood Khalid. Minister Works, Chaudhry Muhammad Aziz, Health Minister, Dr. Najib Naqi, Minister for Forests, Sardar Mir Akbar Khan, Minister Zakat and Usher, Chaudhry Yasin Gulshan, Chief Justice AJK High Court, M Tabbasum Aftab Alvi and large number of people across the Azad Jammu and Kashmir and Pakistan. 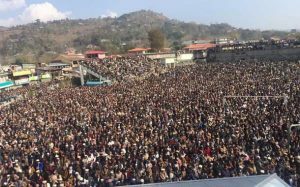 Speaking to mourners at Kot Matay Khan – ancestral village of Sardar Khalid Ibrahim – President Masood Khan said with the death of Sardar Khalid Ibrahim Khan the people of Azad Kashmir have been deprived of a person of great principles, character and impeccable integrity. He said that Sardar Khalid Ibrahim Khan always sided with truth, honesty and justice as he did not believe in regional or any other kind of prejudice and biases. He practiced the politics of moralities and remained steadfast to his principles till his death. Terming the death of Sardar Khalid Ibrahim Khan as a great loss for the people of Azad Kashmir, President Sardar Masood Khan said he was the staunch supporter of Kashmir’s liberation from Indian subjugation and its accession to Pakistan. He added that his death has left a void which will be difficult to fill. 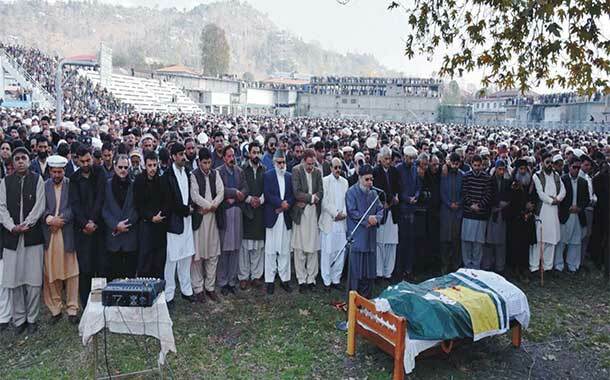 Emotional scenes were witnessed during the funeral prayer as people from all walks of life, relatives, admirers, friends, and political workers from across AJK paid their last respects to Sardar Khalid Ibrahim Khan and mourned his loss with his grieving family. AJK Government announced a holiday for schools and government offices on Monday as a mark of respect to former legislator and scion of Sardar Ibrahim Khan family.